The list of wall clocks available now would be too numerous to mention. But there was a time when almost all clocks were either tower clocks or tall (long case,grandfather clock) clocks. At the very early stages of mechanical clock development, they were weight driven. Because of the distance the weights had to travel, the clock makers built a very tall case to house their clocks. In these early days, the clock movements themselves were inefficient and large because they were all handmade. It was not uncommon for these early tall clocks to be over 8 ft. tall. The weights for these clocks were also very heavy. It was not uncommon for a clock maker to make his movement and then hire a cabinet maker to build the case. These clocks were very expensive and therefore only the wealthy could afford to own clocks. Most people had to rely on their town’s tower clock for the time of day. Eventually, clock makers found that they could sell their clock movements with a dial, but without a case and people could hang them high on the wall with the weights hanging below. This way the clock makers could sell them at lower cost and increase their market. The wall clock was born. The American colony's early clock makers built tall clocks almost exclusively. As in Europe, only the few wealthy could afford to own a clock. Simon Willard, famous for inventing the banjo clock , is believed to be the first American clock maker to start making wall clocks around 1770. These early hanging clocks paved the way for the explosion of clock companies that sprouted in 17th century New England. By about 1820, tall clock production all but ended in America, replaced by the new wall clocks and mantel, or shelf clocks. These clocks were in the price range of most Americans. Octagon clock - These somewhat large clocks were used mostly in public buildings such as schools, offices, and workplaces. They are often referred to as schoolhouse, or office clocks. They are classified as short drop, or long drop depending on the length of their pendulums. Arts and crafts clocks - Often called Mission clocks came about just after 1900 and matched the furniture styles of that day. Banjo clock - This clock, so named because of it being shaped like a banjo, was invented by Simon Willard in 1802. This style was most popular during the 1800's, but has been made in one form or another ever since. Calendar clocks - These were made in several styles, both as wall clocks and mantel clocks. John Hawes of Ithaca N.Y. made the first mass-produced calendar clocks in the 1850's. Some of the top-of-the-line clocks even adjusted for the correct days in the month and for leap year. Most simple styles had one dial with three hands, the third hand pointing to the day. The day numbers were printed outside the minute markers. The better clocks had two dials, one for the time the other for the date. 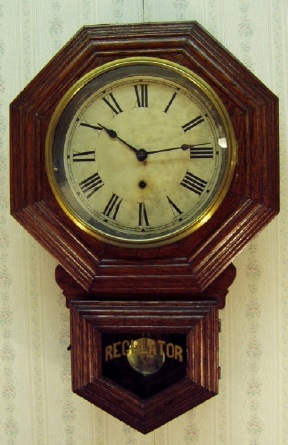 Gallery clocks - Similar to the above octagon clock but without the drop for the pendulum. These were also used in public buildings because of their large easy to read dials. Cuckoo clock - Almost everyone knows what a cuckoo clock looks and sounds like. They come in various sizes from tiny, such as the Lux novelty clocks that were only about 3 in. high, to very large ones. (See picture) Some are time only. Most, however, gong and coo-coo on the hour and half hour. There are some that play music also. Regulator clocks - Sometimes called Vienna regulators , these are usually top of the line clocks that are very accurate. They have long, heavy pendulums and can be time only or they can strike the hours on a gong or on chime rods. Most of the above clocks styles were made by many clock companies, in many countries. The styles are familiar to most of us. There are many other styles that are not as well-known, nor are they as easy to find as the ones mentioned above. Because of this, they usually command a higher price when sold. Some of these are figure 8 clocks, advertising wall clocks, ship's bell clock, wag-on-the- wall clock, English tavern and hooded clock, Zaandam and Morbier clocks to name a few. 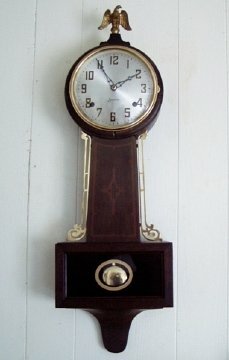 Added to these antique clocks , there are hundreds of styles of newer quartz clocks. There are very few homes today that don't have wall clocks hanging in their home. 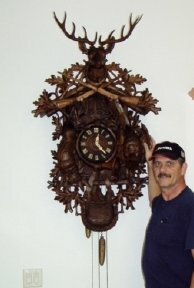 Here is a picture of me and a very large hand-carved cuckoo clock I restored for a friend of mine. I'm not sure of the exact date the clock was made, but it was before WW1 according to the owner's grandfather.